You’ve probably heard the term glazing before in reference to miniature painting. Maybe you’re wondering what glazing is? While I don’t know the proper technical definition an art teacher may tell you, I can explain to the best of my ability. Glazing is applying translucent paint over another layer of paint to alter the color in some way. It may be that a glaze is used to add saturation, or it could be used to completely change the color underneath. Either way, you’re altering the appearance of paint by applying a glaze. I’m sure someone has a much better explanation, but that really should cover it. As mentioned above, a glaze will alter a color. So, why not just paint it the way you want it to begin with? That’s a bit tricky to answer. The great part of a glaze is that it’s a very translucent paint, meaning you can see the previous layer through it. So, you can make subtle changes to something. It may be the color you’re glazing over just needs a slight shift in tone. Instead of repainting it entirely to try and get that tone, try a glaze instead. It’s quicker and easier. A good example is when I’ve painted red. There have been times where once I was done with the red I found it a bit too dull. To remedy that, I applied a red glaze over it and give it more saturation, to brighten it up. The beauty in doing that with a glaze is that I don’t have to repaint everything. There’s no need to base coat again, add layers, and highlights. I simply apply a bright red glaze over everything. The added bonus of a glaze is that it also helps with blending. In the example above with the red, the red glaze I applied helped blend those layers and highlights together as well. Another reason glazing is great. Being able to subtly shift the color of something with a glaze is not to be underestimated as well. 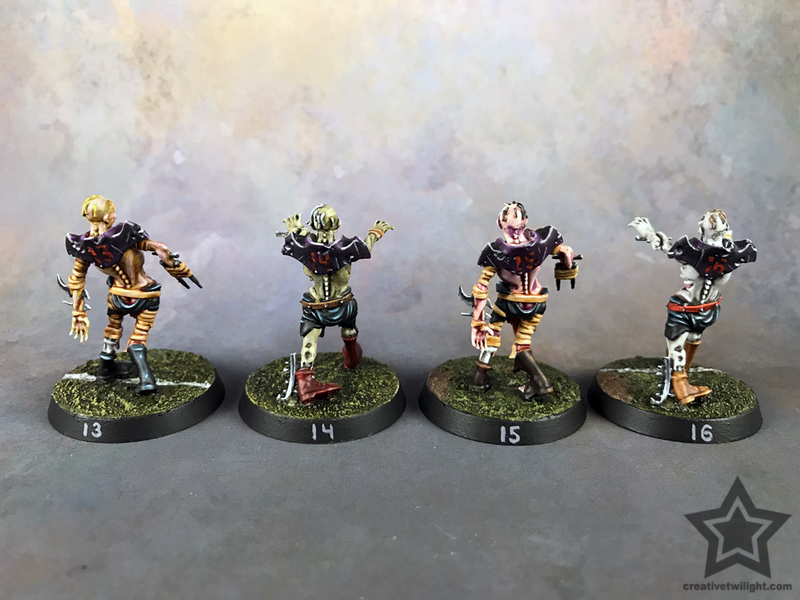 Let’s say you’re painting some zombies and you want some interesting skin tones. We’ve all seen various zombies in movies, TV, comics, etc. You’ll notice that the skin tones on zombies tends to lean towards colors like green, purple, greys, etc. All colors that give the impression of something dead. 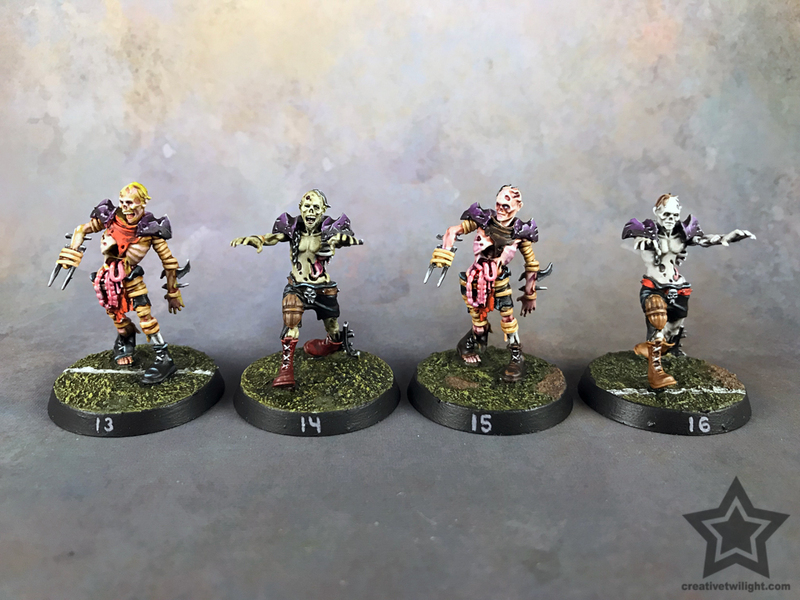 To accomplish that you could paint the skin on the zombie some really light color, a very pallid look. You could then apply a thin glaze to give the skin to shift the skin tone a bit towards green, purple, etc. Here’s some examples of just that. 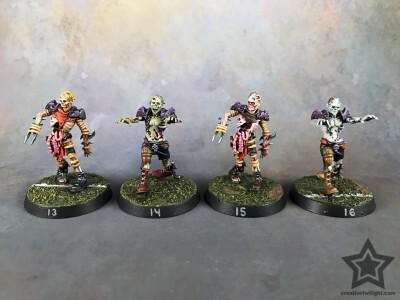 These are Zombies from my Undead Blood Bowl team. To accomplish those skin tones I did just what I mentioned above. I did add a step where I washed the skin. So, I painted it a very light color, washed it to give it shading, and then applied a glaze. 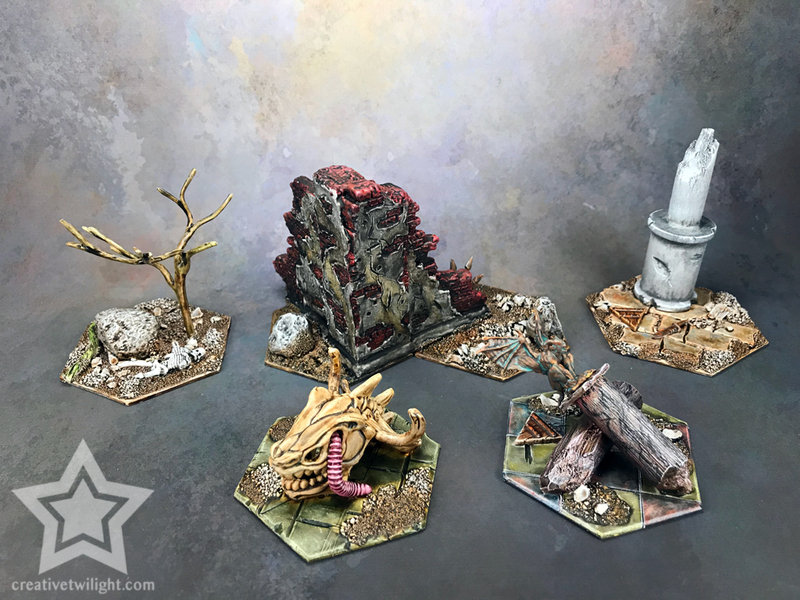 Another example is some terrain I worked on for Warhammer Underworlds. I primed all the terrain white and then painted it using washes and glazes. The washes gave shading and depth, and the glazes gave it color. It’s a very simple way to paint that’s fun. Notice those interesting tones in the flooring? That’s from playing with different glazes. I mean, everything is glazed, but I think the flooring more shows the interesting tones you can get with it. Lastly, here’s a more bold example where I painted a power sword with glazing. Basically, I layered glazes over a white base coat to create what you see. 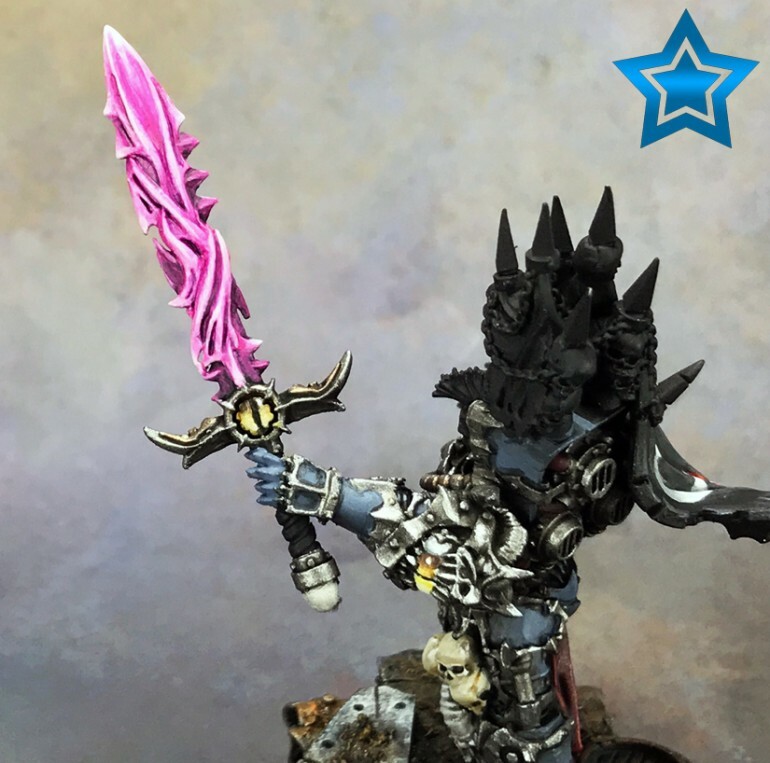 I do have a tutorial on how I painted the power sword if you want more info. Where Do You Buy Glazes? The glazes most miniature painters will find are from Citadel. They offer a range of glazes that cover the primary colors. Personally, I love the Citadel glazes, and it’s where I learned and started playing with glazes. 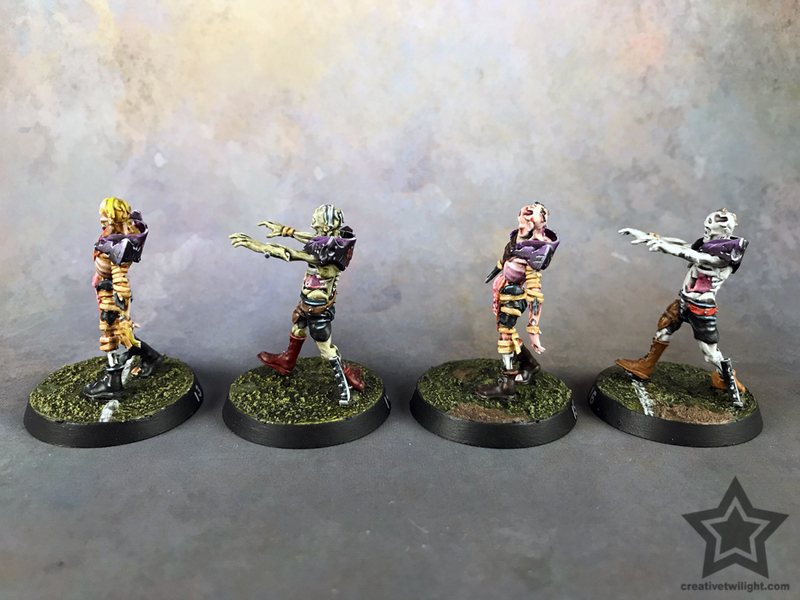 I would say that the glazes from Citadel are perhaps their best product. Now, you may find glazes from other companies as well. I’m going to have to admit ignorance here as the Citadel ones are the only I’ve bought. There’s another option as well. It’s really easy to make your own glaze. What you need is some sort of paint medium and whatever color you want to turn into a glaze. I like using Lahmian Medium from Citadel as my medium. It’s cheap, easy to find, and works very well. There are other companies who make mediums for glazing as well, like Vallejo, and others I’m not aware of. Sorry, limited exposure for me with other paint ranges. Alternatively, you can often find a medium in most arts & crafts stores as well. What a medium does it thins out the paint while keeping the viscosity. In other words, it thins the paint and keeps the color consistent. If you thin paint with water then you’ll find that the paint goes on streaky. That’s because the water breaks the binder in acrylic paint. All you do to make your own glaze is to add a medium to the paint you want to turn into a glaze. That’s it! Most of the time, I will mix at a ratio of about 2 parts medium to 1 part paint. If I want a more subtle effect then I’ll simply add more medium. If you want a stronger glaze then use less medium. Washes make for great glazes as well. Do the same thing and add medium to a wash and now you have a glaze. It’s something I do a lot. Blabbing aside, how do you glaze a miniature? Easy! Most miniature painters have used washes before. If not, I have a tutorial on washes you should check out. Using a glaze is very much like using a wash. You load your brush with the glaze and apply it to the miniature. Unlike a wash, however, you aren’t applying it as thickly. You want to apply a thin even coat over the area. If you use a very thin coat then you can determine if you need another coat. If you go to thick then there’s no undo button. So, go thin and do multiple layers instead. Now, I did a video tutorial on painting some Nighthaunts using a technical paint from Citadel called Hexwraith Flame. I’ll share that here because it shows the processes of glazing very well. Also, Games Workshop did a great video tutorial on using their glazes that’s worth a watch. That’s all there is to glazing. I’m sure I could write more and bore you all to death, but that’s the basics of it. You should definitely play around with glazing. It’s such a simple thing to do that can have a huge impact on the final result. Great painting isn’t about amazing technique and skill; it’s about all those subtle details and layers that bring a model to life. I promise I will try glazing some time, but I am very busy being a completely average painter. Well, glazing isn’t going to make you a better painter, and it’s not a technique, but a tool for the arsenal.